Community Living Ontario is introducing Passport Mentoring to Windsor and Essex County! The goal of Passport Mentoring is to help students with an intellectual disability aged 14 to 21 and enrolled in High School, explore their interests and connect with a person from the community with a shared interest. Passport Mentoring provides students with the chance to explore pursing their interest as an option after High School in regards to future employment or volunteering, and gives them the chance to network and expand their connections within our community. “We are trying to help assist these students to meet up to their personal potential, and trying to ensure that no students are left without the resources to succeed and to feel that they can be valuable, contributing members of our community (whether through employment or volunteerism for example). Simply put, we are trying to help connect young people to the community so they can pursue what they love!” says Priscilla Campbell, Passport Mentor Coordinator for Windsor and Essex County. Passport Mentoring is currently recruiting students who are looking to make a community connection, and mentors/volunteers and businesses to be involved. Campbell says she is “looking for people who can help students learn more about and explore their passions and interests. Each mentoring experience is unique in the way that it will be built around what the student wishes to gain from the program, as well as the time and availability of both the student and mentor”. 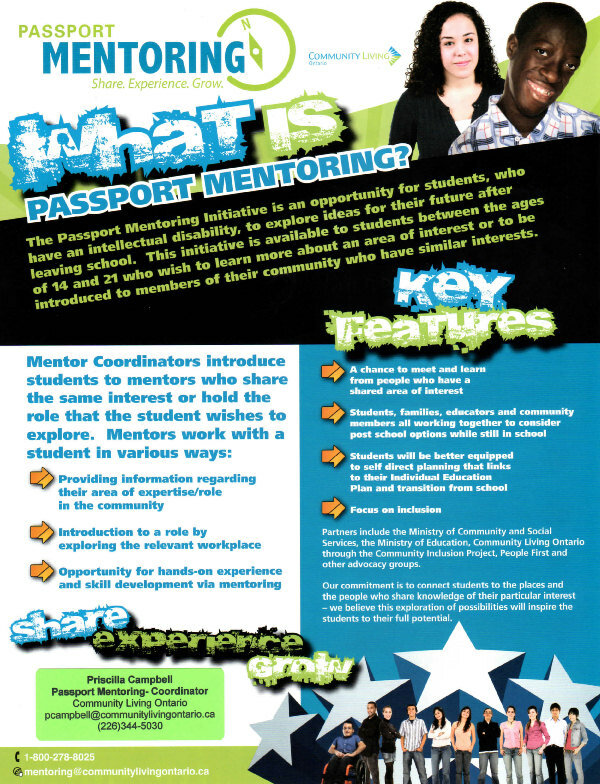 Passport Mentoring does not ask that a mentor/volunteer dedicates any pre-determined amount of time to being a mentor. As a mentor/volunteer, they ask that work with the student be based on their availability and your availability, to create a short term experience that may include; Meeting with the student to provide insight to your area of interest/expertise and help the student gain knowledge about their interest, provide hands on experience around the interest, tour of the workplace or a day or more of job shadowing related to the student’s interest, help explore possible job opportunities or volunteer opportunities based on the area of interest identified by the student. Some of the current interests of students enrolled in the program include, but are not limited to: cooking, art, music, baking, esthetics (hair and nail salons), PC repair, Auto body work and repair, photography, military history, hunting, biking/bicycles, sports related interests, hockey/soccer/basketball, Videographer, TV and film, Daycare/ECE, baking, videogame and web design, animal care/grooming.